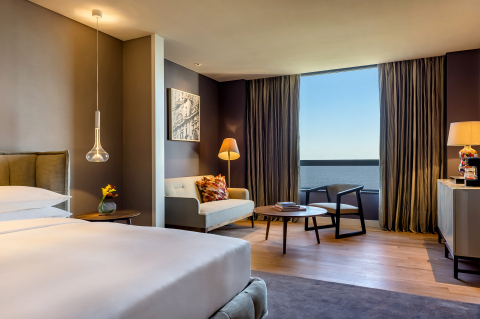 CHICAGO--(BUSINESS WIRE)-- Hyatt announced today the opening of Hyatt Centric Montevideo, the brand’s first hotel to open outside of North America, and the second Hyatt-branded property in Uruguay. The 178-room hotel is located in the bustling Pocitos neighborhood, a prime destination for guests to explore and discover the heart of Montevideo. Hyatt Centric Montevideo is in close proximity to many of the area’s business and leisure districts, including the World Trade Center, Montevideo Shopping and Ciudad Vieja, as well as La Rambla, the coastal avenue where locals meet daily to exercise, socialize and take in the city’s best sunsets. Guests can begin their journey cruising the Uruguayan coastline along La Rambla, the 19 mile (30km) waterside promenade near Hyatt Centric Montevideo. Upon entering the hotel, a large lounge welcomes guests as they make their way to the stylish lobby area. A stained-glass inspired ceiling invites natural light into the space and marks a central point that integrates the hotel’s restaurant, lobby and bar. The hotel design sets the stage for an authentic Montevideo experience and includes mosaic floors, eclectic ambiance and local artwork combined with modern luxury design, creating a touch of local culture. Large windows from the bar, deli and library offer sweeping views of the Rio de la Plata. The hotel’s 178 spacious guestrooms, including 14 suites, balance the energy of the city with a calm, inviting respite. The minimal yet upscale features include contemporary furniture, destination-inspired artwork and modern colorful touches. Guestrooms offer impressive views of Rio de la Plata or the serene cityscape, and combine amenities to meet the needs of the millennial-minded traveler, including a luxurious plush bed, 47-inch LED TV (55-inch in suites), mini bar, large walk-in shower (additional bath tub in suites), generous work desk with enhanced lighting, complimentary high-speed Wi-Fi, premium bath amenities, JBL Horizon alarm clocks, a salon-grade hairdryer, concierge service, and 24 hour in-room dining. Executive rooms and suites also have access to special services and amenities such as the rooftop lounge, which offers 180-degree waterfront views, continental breakfast, and evening cocktails, among other services. Hyatt Centric Montevideo features distinct dining options including breakfast, business lunches, intimate dinners, quick drinks or casual dining experiences designed to inspire food lovers during their journey to explore the best of local flavors. The hotel’s signature restaurant Plantado features a regionally inspired menu offering locally sourced produce and classic Uruguayan favorites for breakfast, lunch and dinner. Behind the culinary concept and menu is the talented Executive Chef Federico Ferrari, formerly of Palacio Duhau - Park Hyatt Buenos Aires. When the sun sets over the city, guests can retreat to the hotel’s vibrant Moderno Bar. Eclectic décor and scenic views complement creative signature cocktails, gourmet small plates and a unique selection of acclaimed local wines and artisan beers. Additional food and beverage amenities include the Deli, a specialty market featuring Uruguayan olive oils and gourmet cheeses, freshly baked goods, local pastries, coffee and teas service, organic juices, to-go foods and other local goods. Hyatt Centric Montevideo’s event facilities total more than 18,700 square feet (1,700 square meters), with each meeting room named after an influential female Uruguayan poet, a tribute to local literature. The fully integrated area features an elegant, multi-purpose ballroom and six sophisticated meeting rooms that provide an extensive range of options for upscale meetings, conferences, social events such as quinceañeras and weddings of all sizes, complete with state-of-the-art audio visual services and dedicated staff to assist in planning and execution. Hyatt Centric Montevideo features a 24-hour fitness studio with the latest high-tech cardio and strength training equipment from Life Fitness®, and offers a massage treatment suite to relax and unwind, as well as a heated indoor pool. Guests that like to take their workout outdoors will have the perfect opportunity to do so along La Rambla, the ideal spot for a walk, jog or to take one of the hotel’s custom-designed vintage bicycles for rides. Hyatt Centric Montevideo is offering a special opening rate of USD $190 plus taxes for standard guestrooms, including breakfast. For full offer details, including terms and conditions, or to make a reservation, please visit hyattcentricmontevideo.com or call +598 26211234. The term “Hyatt” is used in this release for convenience to refer to Hyatt Hotels Corporation and/or one of its affiliates.